Something extraordinary is happening. Humankind’s increasing interconnectedness is causing a global transformation of values and expectations, at both the individual and societal level. The shift is reaching a tipping point that will transform business forever. You don’t have to be an economic detective or business futurist to see myriad signs of the unstoppable rise of a new set of economic prerogatives that prioritise proactive positive impact on people and planet. Consider this shortlist: the emergence of universally available virtual education, the mainstreaming of environmental consciousness on the political and business agenda, the accelerating growth of the organic and Fairtrade foods industry, the growth of impact investing as a sector, the innovation in biosensor-enabled mobile healthcare solutions – these phenomena and more herald a mass movement for good that’s great for humanity. And for business. In fact, it’s business innovation (and not government or other institutional directives) that’s likely to make our world healthier, happier and more sustainably vibrant than ever before. That’s because doing right by people and planet is particularly pragmatic for business, which relies entirely on human and natural capital to generate profit. Arguably, we are hurtling into a new era when new forms of wealth creation could potentially empower billions of people to raise themselves out of poverty, to participate in the broader economy, and to thrive. The catalyst will be an increasingly widely-shared notion: that it’s in all of our best interest to do what’s best for one another, for the environment, for our health and our collective well-being. In other words, new values will explode into exponential economic value. Dubious? It’s happened before. Economic historian and author Deirdre McCloskey has attributed the exponential explosion of wealth in the 19th century (she calls it the Great Enrichment) to ideological innovation. The new idea then: human equality over feudalism, and the belief that liberty and the dignity of human potential should be available to all. This was as commercially motivated as it was ethically inspired. It makes sense that this ideological shift began in the late 1600s, as the world became even more closely connected through trade, and can be attributed to the rise of a bourgeois merchant class first in Holland, and then Britain, from whence it spread to the British Colonies in North America, where it ultimately found its way into one of history’s most famous documents, the Declaration of Independence. Although these iconic words were proclaimed in Philadelphia, this was not a uniquely American ideology – it was a broadly Northern European idea. It’s easy to forget just how dangerously radical this new idea once seemed. That is, until you consider the bloodshed it caused on both sides of the Atlantic as the old aristocracies and their economic dominance (and arguably, ossification) were overthrown. This wave of liberty was driven by a class of people who were in effect entrepreneurs. It underpinned whole new systems of thinking and governance, which ultimately gave rise not only to revolutions, but also to discoveries and innovations that drove unprecedented efficiencies of manufacturing and distribution, and in short order increased the wealth of nations like the UK and the USA– and their citizens — exponentially. The average daily wage in these countries swiftly shot up from 3 dollars to 30 dollars and beyond. New ideas about freedom liberated not only those who weren’t members of the ruling classes – they liberated technological innovation, which in turn unleashed wealth and its after-effects: increased literacy, life span, leisure, infrastructure and quality of life. Culture creates economics, not vice versa. Technology is the means, not the catalyst. Still, beliefs and technology work together in a virtuous circle. Actually, it’s more like an upward spiral. And perhaps the most profound belief-technology upward spiral today is the drive for total connectedness. Connectedness, like democracy, can be controversial. As I write these words, there’s discussion and debate at the United Nations as a coalition of NGOs, philanthropists and nation-states are updating the Millennium Development Goals into a broader call to action for improving life on earth. A key question: whether or not connectedness is a fundamental human right, like the right to clean air and healthy food. There’s discussion because it seems self-evident, and debate because some governments aren’t so keen to open the floodgates of information connectivity to their citizens. But whether enshrined in a universal document on behalf of humanity, or promoted by the seemingly obvious profit motive of global technology corporations, the increasing real-time connection of more of us to each other and to the world around us is set to continue. Because once again, ideology is in the driver’s seat. It’s intriguing to observe that humanity’s most potent technological means of connectivity – the mobile device – and the social imperative of personal empowerment – including the civil rights, gay rights and women’s liberation movements, environmental consciousness, and modern CSR – emerged almost simultaneously about four decades ago. This is not mere hindsight coincidence. The radically progressive values that exploded across university campuses during the 1960’s fueled ideas about self-empowerment and kicked a nascent hippy do-it-yourself movement up a notch, which led not only to Northern California’s Whole Earth Catalogue publishing instructions for home-brewed beer and home-baked bread but also instructions for home-built computers. Indeed, personal computing was led onto the world stage by an ideology of personal empowerment and self-sufficiency. The invention of mobile technology was adjacent to this phenomenon, and over subsequent decades has proven to be the most powerful agent of rich, multidimensional connectivity at nearly all strata of civilization. It’s been observed that throughout modern history, it has consistently taken about forty years for an idea or an innovation to move from the margin to the mainstream. The pace of innovation may accelerate, but the pace of mainstreaming is constant. And thus, forty years later, even the most financially disadvantaged people in emerging markets can pool limited resources and access the Internet on a low-cost mobile phone. For over billion people, the mobile device provided the first and often the only online connection. For those of us who inhabit global cities like London or Los Angeles, it can be startling to remember that are still billions more people who have not yet gotten online, but the momentum toward ubiquitous and universal connectivity is clear. What began with connecting people (is your brain playing the Nokia tune?) through words and voice soon morphed into connected information, multimedia, and commerce as core features of the mobile experience. Then, through integrated sensors, satellites and algorithms, mobiles could connect via context, including location, time, season, behavioral history. Next on the connecting agenda: our biometrics, our feelings, emotions, and ultimately our intentions. And soon, the mobiles that connect us most deeply and broadly will be those we wear on (or in) our bodies and those we drive on our roads, further reshaping our relationship with each other, our transport, and even our biology. Here’s the rub: no matter how we might feel about the tradeoffs between utility and privacy, it will be increasingly challenging to opt out of connectedness. So what are the implications of this more fully and deeply connected life? How does this transform our assumptions about ourselves and each other, our sense of who we are, what we value, and how we exchange it? More specifically, what does this coming shift in values and expectations mean for economics and business? As we humans become more closely interconnected and simultaneously have the means for broadcasting self-expression to others, we become a community. I begin to understand how my actions positively or negatively impact you because you’re able to express those consequences back to me, and over time I internalize what’s good or bad for us both. I also internalize a sense of reciprocity, and so do you. Because it’s in both of our self interests to do so. This sense of reciprocity used to be constrained by geography and culture. However, as our understanding of each other – as our emotional proximity increases, something else grows within us. An inner and shared sense of right and wrong. This inner sense of right and wrong is our conscience. We’re not born with a conscience. It feels like a fundamental part of us, but like language, we learn it through experience and connection. As feel-good as the word may be, conscience is not borne to us on moral or spiritual wings; it’s the logical outcome of human interdependence and continuous self-expression. To put it even more bluntly, according to Darwin, it’s a human survival strategy. And as civilization heads into an unmapped wilderness of potentially destructive climate change, potential broad social upheavals in the face of widening wealth disparity, resource scarcity, overpopulation, the unscripted future of genetic engineering and artificial intelligence and more–a survival strategy could come in handy right now. Connectedness is making us all more interdependent, while giving us ever richer and more persistent means of self-expression. These are two key preconditions for the emergence of conscience. And thus, the most dramatic consequence of ubiquitous connectedness may well be the emergence of a global conscience. Which in turn will give rise to conscientious economic paradigm. 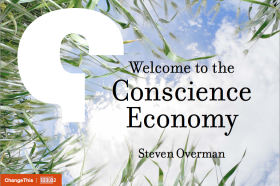 Welcome to the Conscience Economy. This phenomenon is not, in case you are wondering, about upping the CSR budget or organizing more volunteering away days for staff, as well intentioned as these initiatives are. Indeed, smart businesses will do away with CSR as a distinct (read: marginalised) function altogether, and instead distribute social, ethical and environmental competency and capability across their enterprise. Because when good purpose is baked-in to the business model and operating procedure itself, the business is poised to thrive in a market ecosystem that places a measurable premium on trustworthiness and positive social and environmental impact. Because here’s an amazing and uncomfortable truth: in an interdependent, totally connected world, the old rules of economics – and as a consequence the rules of business — no longer hold. Because those rules were based on separation and distance. They were based on not-knowing. Profit was all too often based on what you could get away with. Which usually required at best manipulation and at worst exploitation of the truth. The assumptions upon which neoclassical economic theory are based are crumbling. Because we all know more about each other and our world than ever before. For example, we now understand that natural resources like air and water are not infinite nor free – they are limited, and they need protection. We now understand that political conflict means market instability, and market instability means it’s harder to predict sustainable, thrivable growth – the very forecasts that both long- and short-term investors demand. Meanwhile, in an ever more intimate and connected ecosystem, externalities become material. In other words, factors that influence business outcomes, which we once assumed were out of our control, are increasingly revealing themselves to be part of a cycle of causality. Industry impacts our climate, which impacts natural resources, which impacts prices. Industry impacts human well being and health, which impacts productivity and growth. And consumer utility becomes meaning. It’s not just the usefulness of a thing – people now value what a product or service stands for, how it was made, who made it, and the quality of life that surrounds its manufacture. This meaning – driven less and less by advertising’s emotional bait-and-switch, and more and more by our understanding of business truth – is where profit margin is born. Perhaps the biggest disruption to business-as-used-to-be-usual is this: transparency trumps opacity. If there are things about a business operation that it doesn’t want people to know, well, there’s going to be nowhere to hide. Information is increasingly available, increasingly free, and freely and exponentially shared. The good news about the coming transparency is this: those businesses who authentically operate in synch with Conscience Economy values – delivering positive social, environmental and personal impact — will be considered heroes, and enjoy greater loyalty, and the easier cross-selling and upselling that accompany high levels of trust. Transparency and the concurrent evaporation of privacy is a two-way phenomenon, simultaneously empowering and exposing all players. Government, business, institutions, and individuals can and will all know more about each other. Whether this levels the playing field or tips the balance of power in a new direction is something about which we can only speculate. But one thing is certain: the playing field will be changed forever. Those businesses that are fastest to adapt to the coming Conscience Economy, those enterprises that build “goodness” into their total operations – are poised to benefit from the coming disruption. After all, that which is valuable should be profitable, and what could be more valuable than making life better for everyone, everywhere?